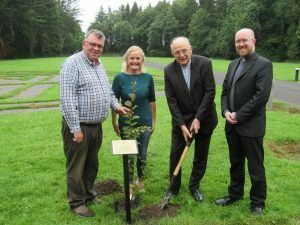 To mark the beginning of the 2018 World Meeting of Families and the visit of Pope Francis to these shores, Bishop Leo O’Reilly of Kilmore planted a commemorative tree in the grounds of the Diocesan Pastoral Centre this morning. The formal diocesan celebration to mark the beginning of this momentous event in the life of the Irish and Universal Church takes place this (Tuesday) evening in St. Ninnidh’s Church, Derrylin, Co. Fermanagh at 7:30p.m. to which all are invited. Refreshments will be served afterwards in the adjacent primary school.